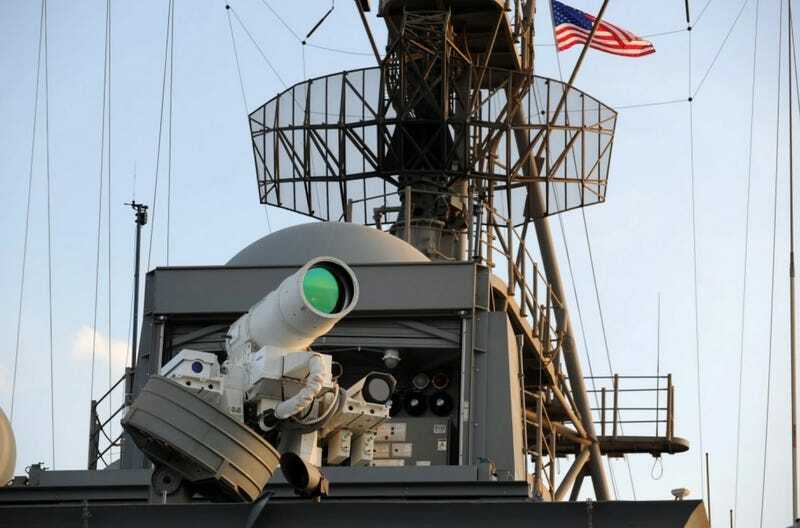 The Navy's first operation laser cannon is now on active duty in Persian Gulf. Perched high above the bridge of America's Afloat Forward Staging Base, the USS Ponce, the Office of Naval Research's Laser Weapon System (LaWS) close-in weapon system has exceeded the Navy's expectations when it comes to reliability and capability and it is now fully integrated into the ship's defenses. LaWS is meant to shoot down unmanned and light aircraft as well as disable small swarming fast boats, but one day its successors could augment and even replace traditional 'kinetic' CIWS systems like the Phalanx and the Rolling-Airframe Missile. The 30kw laser cost the Navy about $40M over the better part of a decade to develop, with the next step being a much more powerful 100kw laser. After decades of research and development and many failed big-ticket programs, tactical lasers are increasingly becoming within the technological reach for the US military, with major advances happening on land, sea and in the air, the impact of which could change combat forever. With each shot costing under a dollar, compared to hundreds of thousands of dollars for a RIM-116 Rolling Airframe Missile, of which they are often fired in pairs, just the economics alone of solid-state defensive laser systems are outstanding. Pair that with the reality that the laser never runs out of ammo and can engage targets at the speed of light and what you get is the future of defensive, and eventually offensive precision light-attack systems.